I wrote the article below when Connecticut was experiencing a bad drought .... back in early 2000. It was very frustrating to be able to see what was taking place and yet most of the population was unaware. The photo above was taken in 2009 in Connecticut. Usually the "chemtrails" are not this blatant anymore, so one needs to be on the lookout for more discreet contrails which turn into cloud cover. The chemtrails above are many separate contrails which are beginning to blend together to form cloud cover. These are not normal condensation trails and it is believed that chemicals have been added to either the fuel mixture or there are separate mechanisms which release this apparent chemical mixture. Normal condensation jet contrails disappear like a wake behind a boat. Although I don't feel that the main purpose of these expanding trails are to make us sick, people do often become ill in the wake of heavy spraying. It is also discussed below as to how chemtrails can also cause flooding. Total cloud cover is often the obvious goal. When the front arrives , one will many times hear low flying jets above the cloud cover. We end up receiving absolutely no rain (even though predicted) or a very negligible amount. When the clouds break up, the air will usually have a definite opaque white cast to it, unlike the more transparent quality of fog. 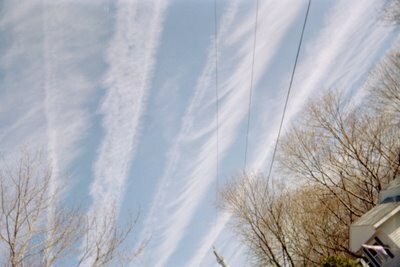 Many chemtrail investigators have evidence that barium salts make up part of the mixture being emitted from these jets. Barium is a dessicant and absorbs moisture. The barium and probably other chemicals may also be used in conjunction with HAARP, which is a joint U.S Air Force and Navy project, to essentially control the weather. The huge Xs being traced by formations of tanker jets in the sky can be tracked by satellite and coordinated with the crossed beams of ionospheric heaters(HAARP) to heat the upper atmosphere, changing its temperature and density and enhancing the storm's effects. Storm Enhancement, Storm Modification and Drought Inducement, are listed objectives of an Air Force research study entitled "Weather as a Force Multiplier." The ultimate goal was stated as "owning the weather by the year 2025." Sometimes this pattern is broken by light spraying, especially around the rising and setting sun. On some days the jets play "connect the clouds" , for what purpose is anyone's guess. Our winter of 2001/2002 has been very bizarre, consistng of unusual severe drought and extremely warm temperatures. I get the general impression from the media that they expect the drought to continue and perhaps cause major problems. To me, it is reminiscent of the biological warfare media propaganda. My personal gut feeling is that they are making a continued drought sound plausible so that when farmers begin to lose their land, water rationing begins and possible famine ensues, it will seem as though it was all a natural occurrence. I can not prove any of this and I do not want to be an alarmist but I feel we must follow our intuitions and spread the word of this possibility before it is too late. We cannot wait for firm evidence to begin our investigation....and it is OUR investigation. We cannot depend and never should have placed so much dependence on our government to solve all our problems. This is a very dangerous practice. I have just begun doing this, so I don't have any results to report on yet except the fact that I was always well received and that a couple of orchard owners I talked to, knew immediately what I was referring to when I mentioned the jet trails that don't dissipate....after all many of these people are outside all day long. The managers and owners said they would pass the information on to their partners and wanted to know how they could get in touch with me if needed. They seemed very grateful for the information. In the past I have tried to inform the general public about chemtrails and have had mixed success. I found that I'm getting more consistently good responses when I have specific information on the specific problem, drought / chemtrails and take it all to the appropriate people / businesses that would be affected and do it all with a desire to help. I tend to be impatient and when the owners weren't available and I tried giving all the information to the workers to pass on to the owners. I was told by several workers that I should wait till the owners are present and if necessary, make an appointment, otherwise the materials will not be taken seriously. This is a very good suggestion. Always speak with the owners / managers otherwise you may be wasting all your materials. Don't be shy about firmly asking to see the owner / manager. If drought appears like it may be an ongoing problem in your area and it's going to affect their bottom line, they will not feel like you are wasting their time. People are beginning to feel that something strange and different is going on and if you approach with the right motive in your heart, people will sense this. You may want to explain the process involving media disinformation so that when it occurs they will not be swayed and will be able to discern the lies from the truth. When agendas are being uncovered those who are responsible may scurry to come up with alternate explanations or even partial truths to cover up and confuse the public. Give them a few possible examples pertaining to the drought situation such as the President announcing that chemtrails are solely for the prevention of global warming. Considering that Gorbachev and others in the One world Government crowd have declared that the environment and the global warming scenario will be the cornerstone of the "New World Order", those you are informing will be aware and not be deceived when disinformation presents itself.